Growing up, I have fond memories of the Apple Cobbler that my dad used to make. It smelled so good, and I loved digging into it while it was still warm from the oven. But, the truth is, I would always just pick off the cobbler topping and not really eat the apples… They were always a bit tart for my taste. So, now that I’m all grown up, I’m making a cobbler of my own – omitting the apples and swapping them for some strawberries and rhubarb. You see, I never was a fan of apple pie either, but I’ve always loved strawberry rhubarb. Rick does too. In fact, when we’re staying at our beach house in the summertime, we always make a point to wake up early on Saturday mornings and head to the farmer’s market in Neskowin. You have to get there right when they open, otherwise the strawberry rhubarb pie will be totally sold out within 30-minutes. The farmer’s market hasn’t opened yet, and I’ve been craving strawberry rhubarb in a big way. 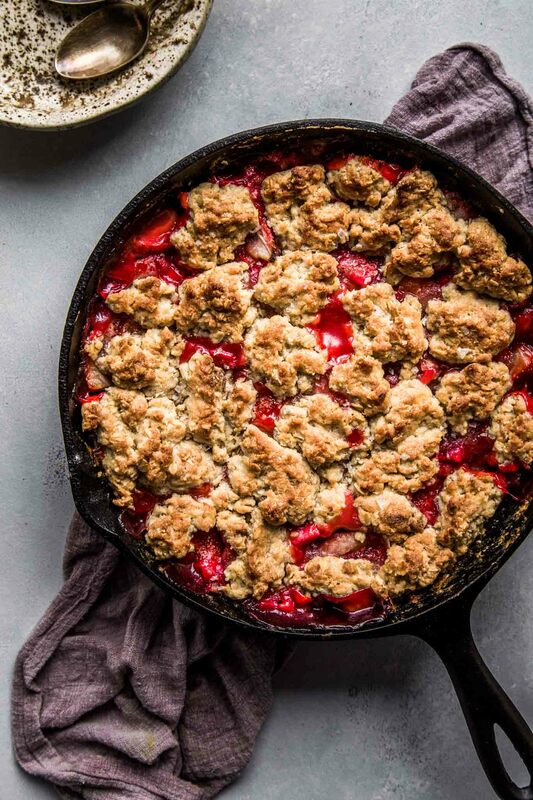 I’ve also been seeing lots of rhubarb in our grocery store lately, so I decided just to go for it and make this Strawberry Rhubarb Skillet Cobbler. Friends… This is one amazing cobbler. 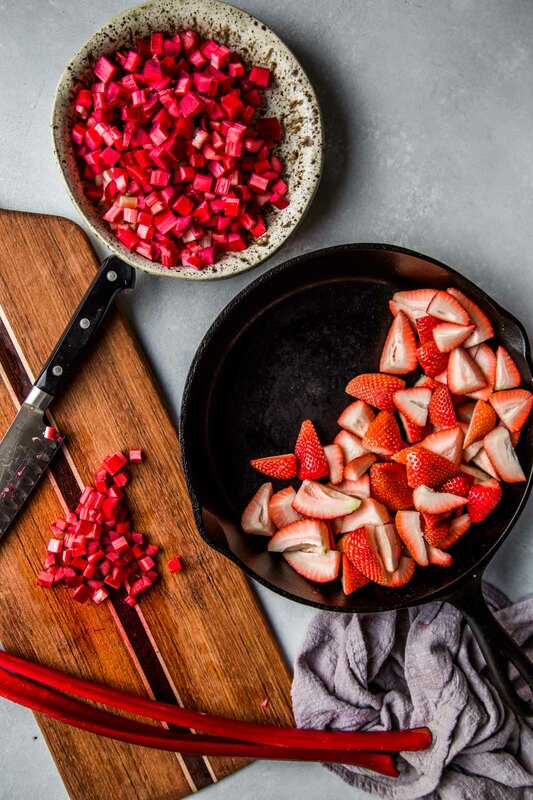 It’s got sweet and delicious strawberries that concentrate as they cook away in the cast iron skillet. 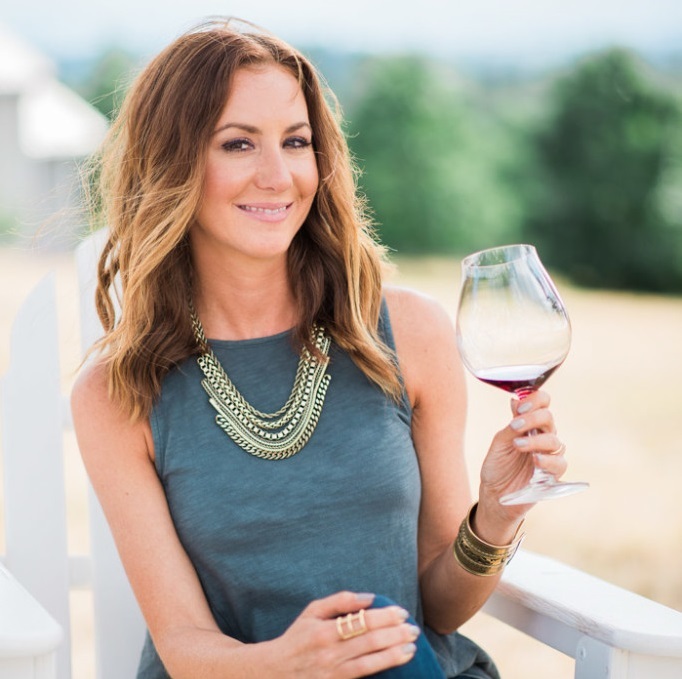 It’s got tangy rhubarb that balances out that sweetness just perfectly. 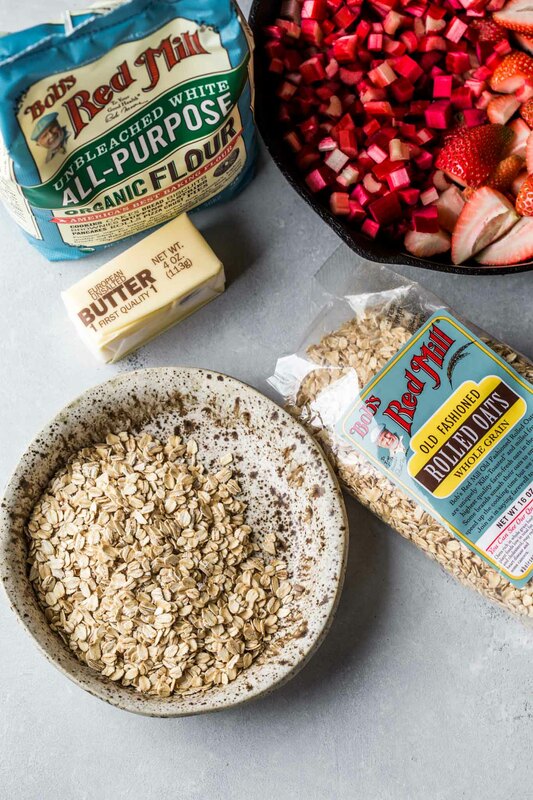 It’s got a crumbly cobbler topping that’s made extra hearty with the addition of some oats. 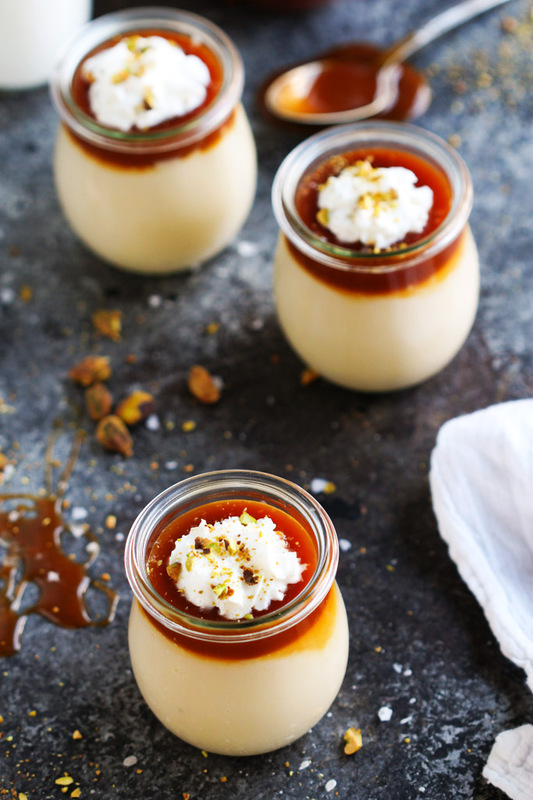 And, to just take everything over the top, it’s got a sprinkling of cardamom, which adds just that hint of something extra, and makes you think – “Hmmm… What is that delicious flavor I’m tasting?” It almost tingles on your tongue. I think there are two things that really take this cobbler over the top. 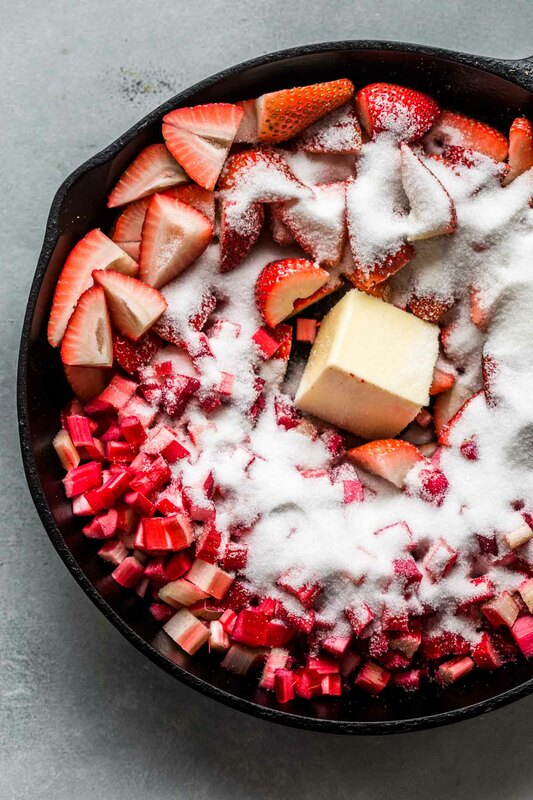 First, cooking those strawberries and rhubarb together in that cast iron skillet with a bit of vanilla and sugar. The flavors get really concentrated and delicious and the fruit thickens up a bit so there’s no fear of having a watery cobbler. Second, using high-quality ingredients. I always reach for Bob’s Red Mill Organic Unbleached White Flour when I’m baking. Not only is it freshly milled right here in Oregon, but it’s also the same high protein flour used by professional bakers. I don’t consider myself a professional baker by any means, but I like to think that Bob’s Red Mill helps get me closer to that goal. I have noticed that when I use their flour, my baked goods definitely turn out to be more light and airy. And the topping for this cobbler made with their flour and old-fashioned rolled oats was definitely delicious, with just the right amount of crunch and all combined together with that touch of cardamom, I could have been brought back to my childhood days where I’d be happy just eating that cobbler topping, it would have been a shame to miss out on the delicious strawberries and rhubarb that were hiding underneath. 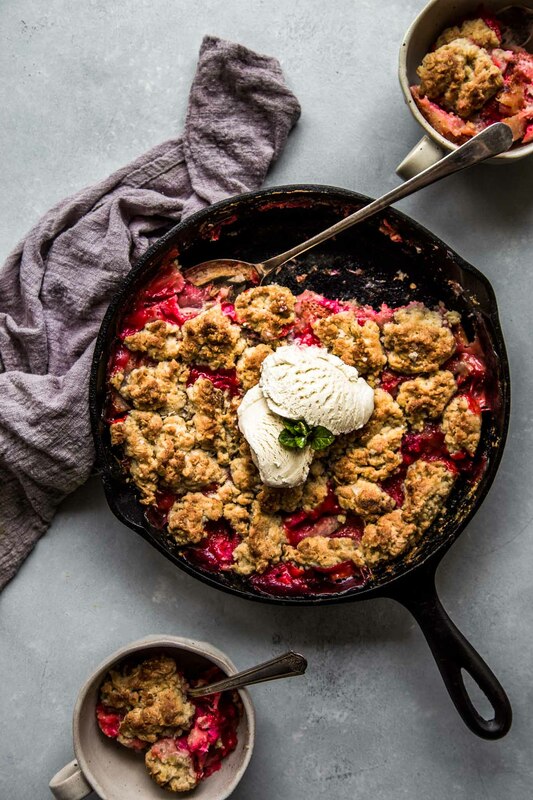 I topped my helping of Strawberry Rhubarb Skillet Cobbler with a scoop of vanilla bean ice cream. But let’s be honest… My helping was the entire cast iron skillet since Rick was out of town. Sometimes it’s good to be an adult and know that you don’t have to ask anyone’s permission to just dig right into the skillet. Do you have a favorite cobbler flavor? Tell me I’m not the only one who doesn’t enjoy apple cobbler… I’d love to hear in the comments below. 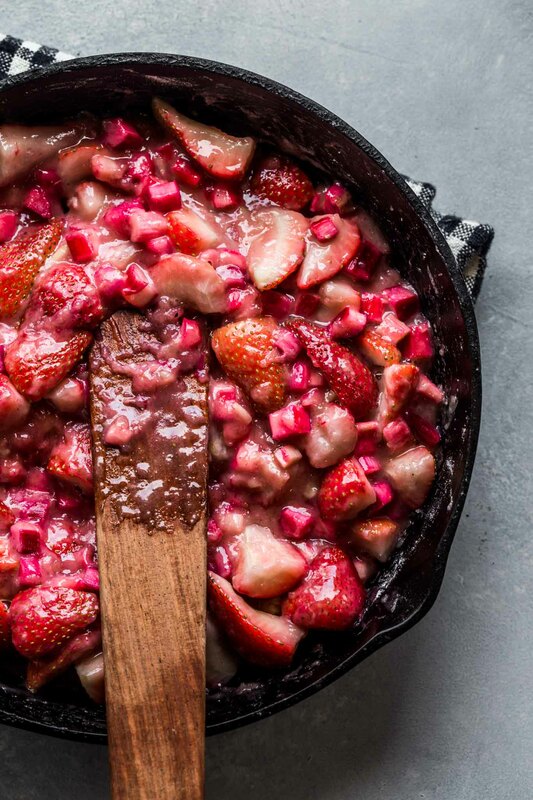 In a 10-inch cast iron skillet, add berries, rhubarb, sugar, butter, flour, cornstarch, vanilla and salt. Cook on stovetop over medium heat, stirring regularly, until bubbly and thickened. Meanwhile, in a stand mixer with paddle attachment, add the 1 cup flour, oats, sugar, cardamom and salt. Add the butter and mix until mixture holds together in coarse clumps. Adding a splash of water if needed. 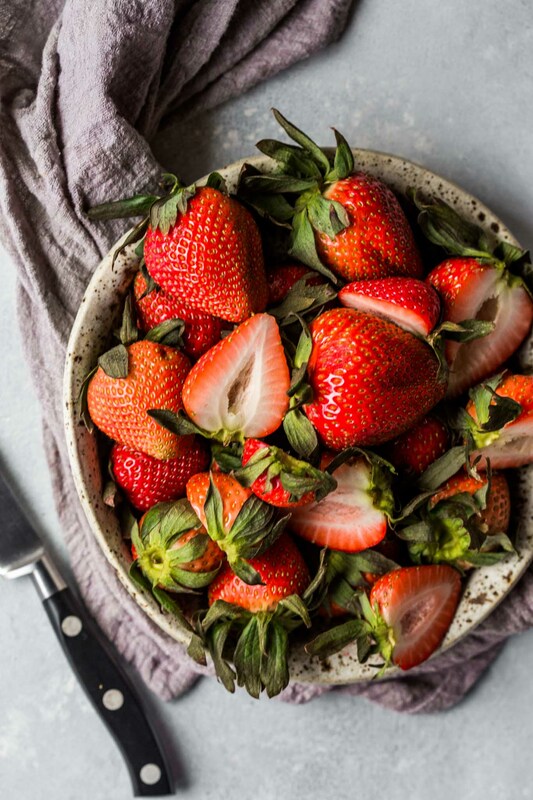 When fruit is ready, drop large tablespoons of dough on top of warm fruit. Place into preheated oven and bake for 35-40 minutes, until the edges are bubbling and the top is golden brown. Serve warm as is or topped with ice cream. 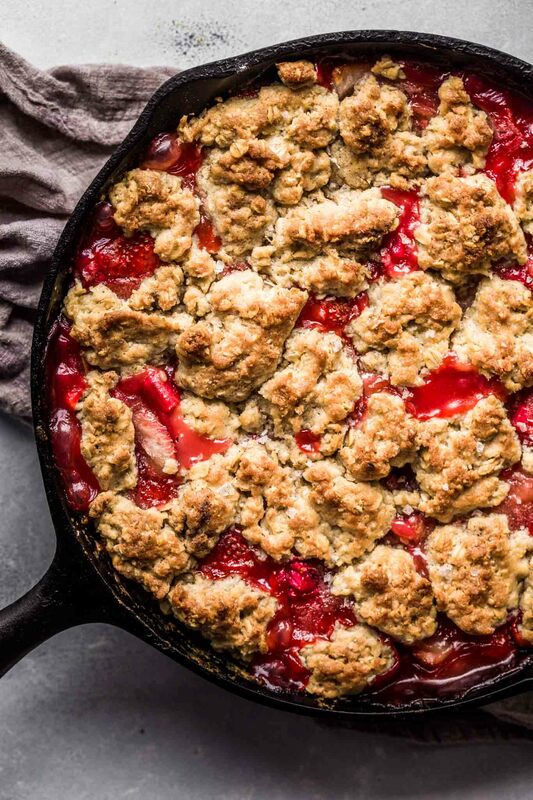 If you loved this Strawberry Rhubarb Skillet Cobbler I would appreciate it so much if you would give this recipe a star review! Also, be sure to snap a picture of your finished cobbler and share it with me on Instagram using the hashtag #platingsandpairings and tagging me @platingsandpairings. Oh man this looks so delicious! My husband’s favorite dessert in the world is strawberry rhubarb pie. I’m more of a cobbler (or crisp) fan, so this is the perfect combination for us! We’ve also got a bunch of strawberries we planted in our garden a couple weeks ago (supposed to be ready by June… crossing my fingers!). Beautiful photos! 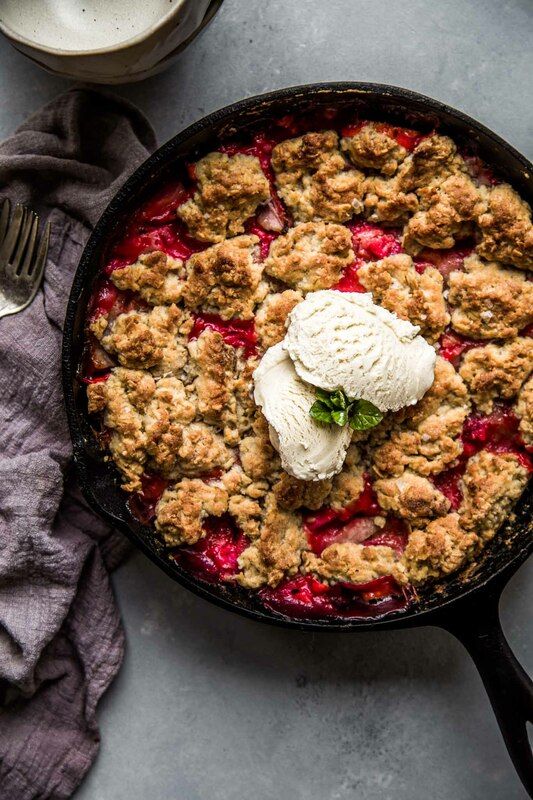 I’m not a rhubarb fan, but I love a good ol’ triple berry cobbler or crisp. 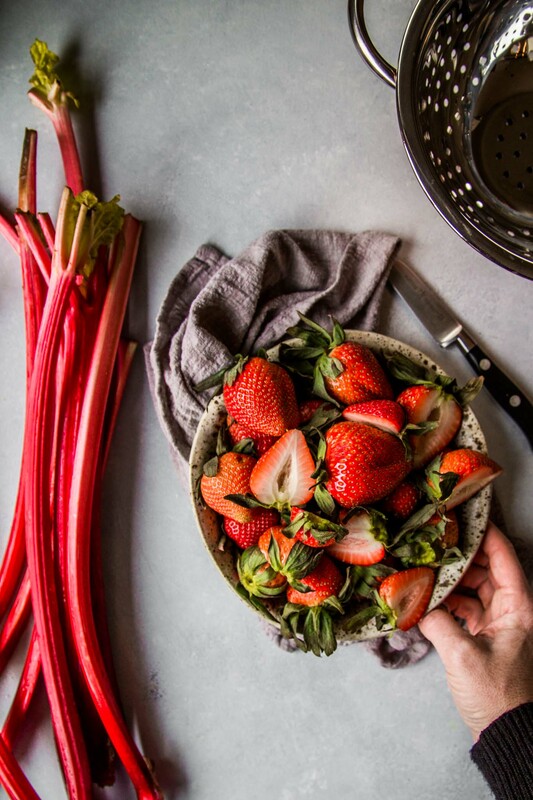 This looks like a great cobbler to make for summer BBQs coming up though, since most of my friends do love the classic strawberry + rhubarb combo! I’m salivating looking at this beautiful cobbler. 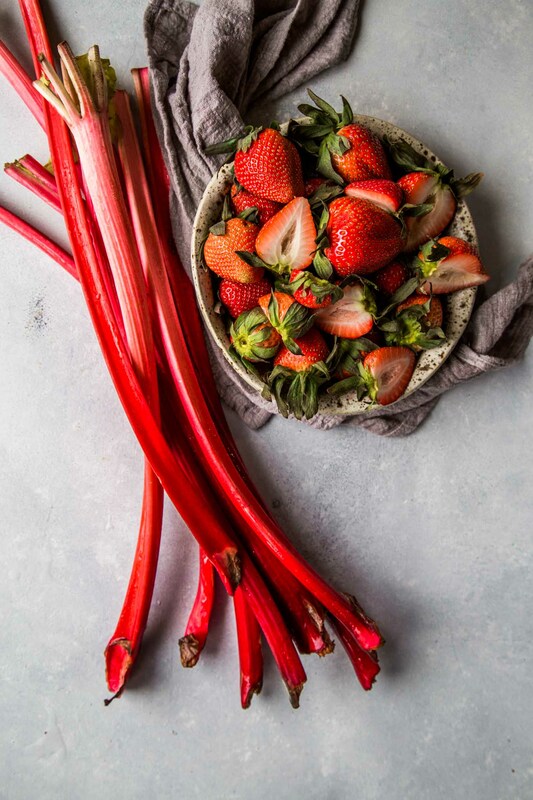 I adore strawberries and rhubarb together. Need to save up for the cardamom, though, the smallest size jar of the ground stuff is at least eight bucks at my grocery store. I think it’s almost as expensive as saffron. It is a fairly expensive spice – Agreed! You can also leave it out or even swap in a bit of cinnamon. Could you substitute another flour such as Spelt or another healthy one? Any suggestions?? Hi Pauline – I think that any flour substitution would work perfectly! 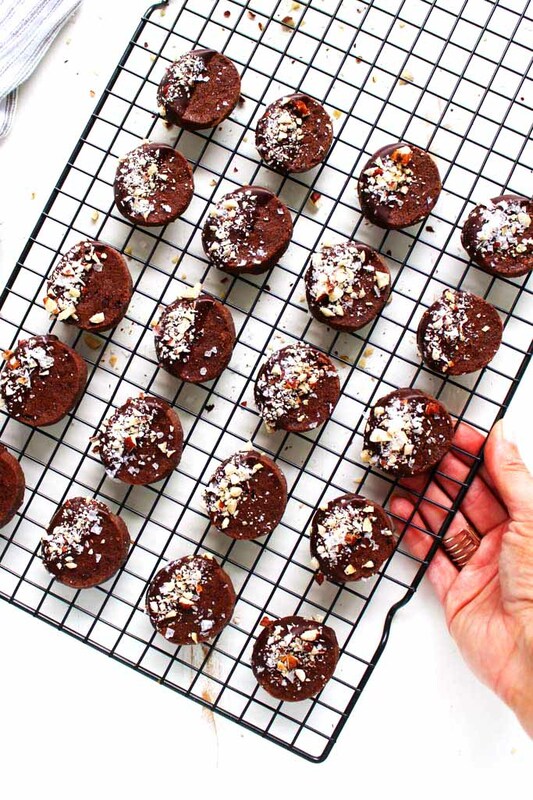 Almond flour would be good in this recipe. I’ve made this recipe for Father’s Day. When I asked everyone tonight if they wanted me to make it again it was a resounding yes! I’m so happy to hear that everyone loved it Lisette!